Before they became top advisers to the Trump campaign, Paul Manafort and his protégé Rick Gates teamed up to make millions of dollars trying to convince the West that another controversial president was no Russian stooge — Ukraine's Viktor Yanukovych. Now, Manafort and Gates are accused of being partners in crime, according to a pair of federal indictments. They were the first two people to be charged Monday in special counsel Robert Mueller’s ongoing investigation into the Trump campaign’s alleged ties to Russia and Moscow’ s interference in the presidential election. Among other things, Manafort and Gates are accused of laundering the millions they made in Ukraine before signing on with Team Trump. The Trump administration immediately sought to distance itself from the pair. "Today's announcement has nothing to do with the president, and has nothing to do with the president's campaign, or his campaign activity," White House spokeswoman Sarah Huckabee Sanders insisted. "The last known conversation was back all the way to February, and as far as anything beyond that, with Paul, I'm not sure." As Sanders addressed the White House press corps, Manafort and Gates both pleaded not guilty at their arraignments. “There is no evidence that Mr. Manafort or the Trump campaign colluded with the Russians,” Manafort's lawyer, Kevin Downing, said outside the court. Gates' spokesman Glenn Selig insisted he, too, did nothing illegal. "He welcomes the opportunity to confront these charges in court," Selig said in a statement. "This fight is just beginning." But a short time later, Gates was fired from his consultant job at Colony Northstar, a company headed by Trump confidante Tom Barrack, a company spokesman told NBC News. Four months before the indictments were handed down, as Mueller’s investigation was gathering steam, Gates insisted that he and Manafort were simply victims of a smear campaign by Democrats and other enemies of President Donald Trump. That remains to be seen. But there’s no denying that Manafort and Gates were in the “Trump orbit,” even if the words “collusion with Russia” do not appear in their indictments. Manafort, 68, and Gates, 45, have been working together for decades. The son of a former New Britain, Connecticut, mayor, Manafort was already a big player in D.C. when Gates signed on as an intern at his high-powered consulting firm Black, Manafort, Stone, Kelly (BMSK). A long-time Republican operative, Manafort had worked for Gerald Ford and Ronald Reagan before hanging out a shingle in 1980 and launching a lobbying firm with admitted dirty-trickster and Trump crony Roger Stone, GOP insider Charles Black Jr., and former Democratic National Committee chair Peter Kelly. Manafort went on to advise the presidential campaigns of Republicans like George H.W. Bush and Bob Dole. He also made a mint rebranding unsavory strongmen like Filipino dictator Ferdinand Marcos and Mobutu Sese Seko of Zaire. Angolan rebel leader Jonas Savimbi was also a BMSK client as were the governments of Kenya, Equatorial Guinea, Nigeria and the Dominican Republic. The Trump Organization also hired BMSK to help them get the ill-fated Trump Airlines off the ground in 1989. The shuttle service to Washington and Boston from New York City was grounded after it took on too much debt and was later sold to USAir. Manafort left BMSK shortly after Gates started there. But they were reunited in 2006 when Manafort launched a new company with Republican lobbyist Rick Davis called Davis Manafort, according to The New York Times. Davis brought Gates into the new outfit. It was while working in Ukraine for Yanukovych that Manafort found himself propping up a president who was favored by Russian strongman Vladimir Putin and opposed by the U.S., NATO and millions of Ukrainians. Yanukovych, widely criticized for corruption and for cracking down on civil rights, was eventually ousted by the so-called Orange Revolution and fled to Moscow. He left behind hand-written ledgers that $12.7 million in cash payments were made to Manafort between 2007 and 2012. Manafort, though a spokesman, insisted the ledgers were forgeries and that he never received any secret cash payments. After Manafort's arraignment, Downing released a statement in which he made no mention of Yanukovych and insisted his client was actually trying to move Ukraine out of Moscow's orbit. 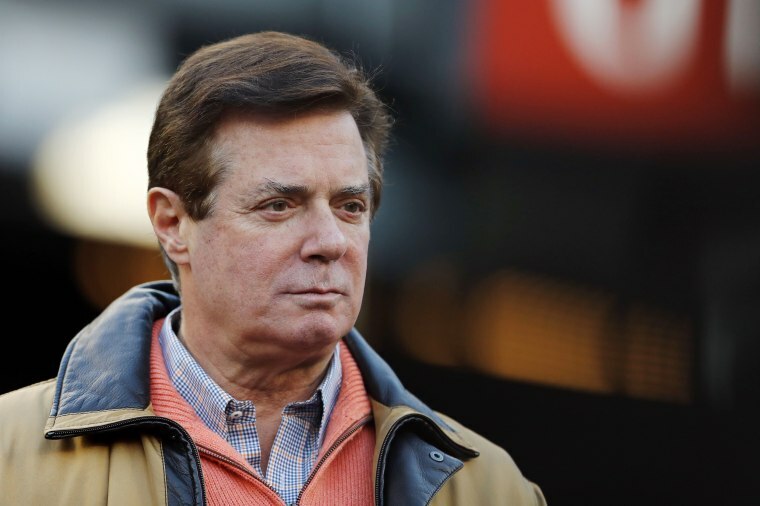 "Mr. Manafort represented pro-European Union campaigns for the Ukrainians and in the course of that representation he was seeking to further democracy and to help the Ukrainians come closer to the United States and to the E.U." Downing, in his statement, also said Manafort did nothing illegal when he opened offshore bank accounts. "The second thing about this indictment that I, myself, find most ridiculous is a claim that maintaining offshore accounts to bring all your funds into the United States, as a scheme to conceal from the United States government, is ridiculous," Downing wrote. NBC has reported those accounts were at banks on Cyprus, which has long been a hub for moving money in and out of Russia. Meanwhile, Gates was making regular trips to Moscow to drum up business with Russian oligarch Oleg Deripaska, a Putin ally who was barred from the U.S. because of his alleged ties to organized crime. Manafort joined the Trump campaign in March 2016 and was promoted campaign manager after Trump fired Corey Lewandowski. He then brought in Gates as his deputy. That June, Manafort took part in the now-infamous Trump Tower meeting with a Russian lawyer who allegedly had dirt on rival Hillary Clinton — a sit-down that also included Donald Trump Jr. and presidential son-in-law Jared Kushner. Two months later, though, Trump asked Manafort to resign after the ledger story broke and The Associated Press reported that he had orchestrated a secret Washington lobbying operation until 2014 on behalf of a pro-Russian Ukrainian political party. Gates, however, headed over to the Republican National Committee and later a pro-Trump nonprofit called American First Policies where one of the perks was regular access to the Trump White House. That ended in March when Gates was forced out after the AP reported on his ties to Deripaska.